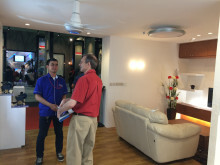 Jakarta, Indonesia - Panasonic Gobel Eco Solutions Sales Indonesia(PESGSID) set up its first booth at INDOBUILDTECH 2015, the largest building material exhibition in Indonesia from June 3-7, 2015. Held at the Jakarta Convention Center, a total of 470 companies showcased their latest technologies and products, with more than 35,000 attendance. 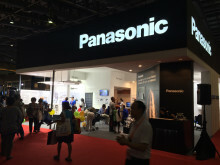 Panasonic’s booth was divided into a main booth and five sections for targeting different markets. The main booth demonstrated the company’s top-design LED fixtures ”Smart Archi” , which can realize consistent, integrated lighting planning for entire spaces. In addition, the donation of LED floodlights to the Prambanan temple compounds was introduced.. In the office area, two main products were focused on. The first product OKIJIKI, highlights the ability of Panasonic’s product flexibility for rearranging floor wiring for the office while the LED iD series features a lineup of LED lighting of various shapes, luminance and functions. 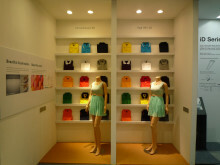 In the shops area, visitors can compare high CRI (colour rending index) models of LED which create beautiful light colour in comparison to conventional LED lighting. With a more beautiful light colour, shop fronts and displays will appear more vivid and attractive to customers. 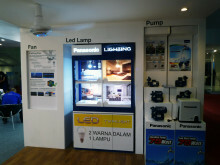 In the home area, a variety of interior lighting simulation, lightbulbs, ceiling fans and water pump are displayed. 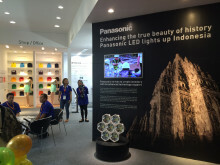 Panasonic began its interior lighting business in Indonesia and have since opened five showrooms in Jakarta, Surabaya and Makassar for architects and developers to experience firsthand the various lighting devices made available in the country. 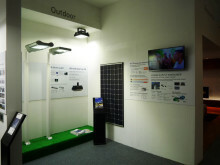 A display of Panasonic’s LED street light and solar panel was demonstrated in the Outdoor (Infrastructure) area. As the Indonesian government aggressively plans for energy-saving policies to upgrade infrastructures with the upcoming Asian Games in 2018, Panasonic expects investment of infrastructure to increase rapidly. Solutions such as LED street lights will not only contribute to the development of Indonesian society but provide good quality coupled with energy-saving efficiency for a cleaner environment. 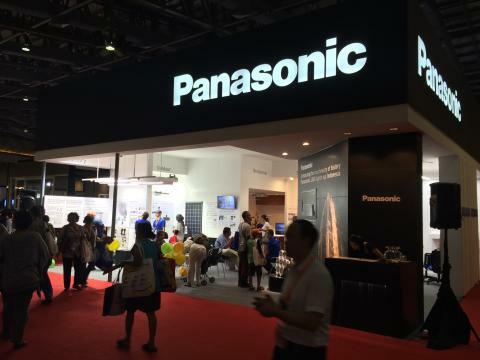 This year marks the first year of expansion into professional LED lighting business for Panasonic. With the opening of a new showroom that sets the track for the company, Panasonic aims to achieve high targets with 10 billion yen sales in its 2018 fiscal year. Reaching out to customers through INDOBUILDTECH is just the first step.